Auricular therapy is one of the most dramatically effective methods of pain relief. When the right treatment methods and ear points are used it is common for people in severe pain to notice significant improvement after just a few minutes of treatment. How long lasting the pain relief is depends on the method of treatment and how it is combined with other techniques. For the uninitiated, auricular therapy involves stimulating special acu-points in the ears, for the purpose of pain relief, relaxation of nervous tension, dyslexia, addiction and a host of other health conditions. Stimulation is done with needles, magnets, heat, microcurrent, color light therapy or acu-pressure. Auricular therapy is based on the principle of holography, more about that later. On this page I will explain what I consider to be the most effective methods for auricular therapy. 1. Acupuncture needling – Thin, half-inch needles are commonly used. Acupuncture needling should only be done by licensed professionals and proper clean needle technique must be followed. Needles actually create a mini-trauma that stimulates release of peptides in the body that can relieve inflammation and promote healing and Yin-Yang balance. 2. Auricular acupressure – The simplest method of auricular treatment, and one accessible to anyone, is to use a small stylus with a 2 – 3 mm rounded tip to stimulate points by rubbing them. The stylus is also excellent for locating good treatment points, as the active points requiring treatment will often elicit a strong “ouch” reaction when pressed on. One author suggests saving ball-point pens that have run out of ink, as they are a good size for this purpose. Auricular point styluses are also available from acupuncture supply companies. 3. Intra-dermal needles or ear pellets – This is an excellent way to provide continuing therapy after a treatment session. There are many products available through acupuncture supply companies for this purpose. Some consist of tiny needles that pierce the skin on the ear with a circle of adhesive tape around it. These are affixed to auricular points requiring ongoing treatment. Alternatively there are small seeds and metal balls that can be taped to points that do not pierce the skin. In either case the device is kept in place for several days after the treatment. The patient should be instructed to rub the pellet or needle lightly several times a day to re-activate its effects. When using intra-dermal needles practice Clean Needle Technique by cleansing the ear prior to insertion and monitoring carefully for any irritation. 4. Microlight therapy – Microlight is a patented technology that both locates acu-points and delivers highly effective treatment. It can significantly boost the effectiveness of auricular therapy over the methods listed above. Microlight applies a combination of microcurrent and color light therapy to body or ear acu-points through special hand-held wands. When used for auricular therapy a 2 mm metal auricular probe tip is used for accurate point treatment. Each auricular point is stimulated for 20 – 30 seconds. Color therapy is selected according to the needs of the client. More about color matching for auricular points below. One of my early teachers was way into the use of microcurrent therapy for acupuncture. He taught us how the ear and body points could be effectively stimulated without use of needles. The basic method was for the patient to hold a brass grounding rod that connected to the microcurrent device, while the acupuncturist used another probe with a small tip to stimulate the ear points. I used both needle and non-needle methods for many years with good results. By the year 1987 I was frustrated with the limitations of microcurrent devices on the market and started designing my own, more versatile systems. I experimented with many variations of microcurrent outputs, including polarity, frequency, waveform and modulations. Eventually I learned which combinations produced the fastest and longest-lasting effects. I worked with a team of engineers in New Haven, Connecticut to develop and release the first Acutron microcurrent system based on these findings. This device offered pre-set treatment combinations to make it quick and easy to set up for those techno-phobic colleagues. It was released after gaining FDA registration in 1988. Several new generations of the equipment have been released since then. One of the features of the Acutron is auricular therapy. I sought to find ways to extend the effectiveness and carry-over of relief for this therapy. I found what I was looking for through the principle of holography and color resonance. We live in a holographic universe. This means that the huge objects and systems of our universe, such as galaxies, solar systems and planets are reflected in the tiny aspects, such as atoms and sub-atomic particles. The principle of holography reveals that each part of a system contains the whole system. A micro-system is a region on the body that contains a holographic map of the entire body. Each micro-system consists of a layout of points in it that corresponds to all regions of the body. Stimulating a point in a micro-system corresponding to a part of the body with pain or disease could help relieve that condition. In some cases the micro-system point can also be used diagnostically. Areas of discoloration, pitting or high sensitivity to palpation in regions of the ear, for example, can reveal pathologies in the corresponding body regions. Therefore a good way to sum up holography is that “Each part contains the whole”. 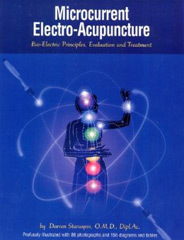 Micro-systems in common use by acupuncturists and body-workers are located in the ears, hands, feet, abdomen and face. Each of these can be used for diagnosis and treatment of multiple body regions. My favorite technique for microcurrent treatment of the ear is Auricular Micro-Macro technique. The great effectiveness of this method is based on the holographic nature of the body. This technique uses a microcurrent device to connect a painful or pathologic point on the body to the ear acupuncture point corresponding to it. Method: Set up your device for polarized probe treatment. Select the color match for the condition or ear point to be treated (see below). Use a small 2 mm auricular probe tip for the probe treating the auricular points. Place the positive polarity probe on the painful or dysfunctional body point. This could be an ah-shi pain point, Organ Mu point, chakra point or other point of special effect relating to the pathology. Place the negative probe with auricular tip onto the ear point corresponding to the painful or diseased body part. The Acutron device supports all of these steps, and also provides accurate ear point location. Have the person move the affected body area, if applicable, while you apply treatment. After experiencing the great power of microcurrent treatment of auricular points I started experimenting in 2001 with adding color light therapy. It quickly became apparent that applying therapeutic colors to the ear while stimulating ear points with microcurrent produced improved results. We work with the system of therapeutic colors taught by Dinshah Ghadiali, as these 12 colors can treat virtually any disorder of the body or mind. Once you have learned the effects of the 12 main healing colors on the body and mind you won’t have to memorize color indications for auricular therapy. You will be able to match up useful colors by simply looking at the name or purpose of the auricular point and then selecting a treatment color with complementary effects. As an example, let’s look at auricular point Shenmen to make this easy to understand. Color Match: Either Violet or Magenta are top choices for complementing and amplifying the effects of stimulating Shenmen. Other colors could be used as well such as Blue, Indigo or Green. The following chart illustrates color matching for some auricular points commonly used for treating psycho-emotional disorders. In this auricular treatment diagrams in this chapter I have used the color match for each point that is a good example. These are not necessarily the best colors to use for all patients. I suggest that you learn more about the colors and try others listed on the chart, or even colors not listed, according to your understanding and intuition. You can also use various forms of kinesiology for confirming the ideal color for treating a point in a particular patient at a particular time. 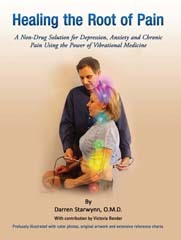 Auricular Micro-Macro technique can boost effectiveness for auricular therapy using the principles of holography and vibrational color resonance. It is an enhancement of traditional needle, acu-pressure or microcurrent auricular therapy methods. This technique is easily learned and can be readily done with the Acutron Microlight probe system using an auricular probe tip.